Provide water sources – all animals need water and this is especially true during hot temperatures when many animals are susceptible to heat stress. You can help by leaving water bowls out during hot weather, or why not consider installing a permanent bird bath or pond. Just make sure you place the water source in an open space where the animal can see predators coming. Put in trees and plants for food and shelter – native plants and trees are a source of food and shelter for many wild animals. For example in the case of birds, dense bushy shrubs provide shelter for little birds and tall trees such as eucalypts are ideal shelter for larger birds. 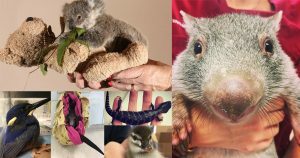 If you would like to support AREPH’s work in treating sick and injured wildlife, you can make a donation. There is no minimum, every little bit counts and donations of $2 or more are tax deductible. Download our AREPH donation form.